That's a night from the Premier League. Thanks for all of your company today, and don't forget you can follow the return of David Moyes and tonight's boxing on our live pages. Former Manchester United boss David Moyes has former Arsenal forward Carlos Vela in his side this evening. in our European live text page here. Crystal Palace face Liverpool in a repeat of the game which eventually cost Liverpool the title last year. Then Hull face Tottenham at 16:00 GMT. Both of those games will of course be covered here. It has been great to have the Premier League back. A fine day of action, 15 goals and plenty of talking points. But what else is coming this weekend? Tony, Lincoln: United fortunate to win. Arsenal must get their defence right. Convinced they will make top 4 at the season's end. No good getting shot of Wenger. He will sort it. Akbar: In the transfer window that Wenger signed Ozil for 42 million he also signed Flamini for free. That in a nutshell shows how shockingly flawed Wenger's transfer and tactical philosophy is. Arsene Wenger says that he does not expect Wojciech Szczesny to have a bad injury but he does not know about Jack Wilshere's ankle. Photogenic: The good news is that you won't need many points to finish in top 4 this season. One strong team & 19 average teams. Ellis Hickey: Arsenal need a manager who will provide a second plan instead of passing and wishing for the best. Louis van Gaal says he very frustrated at having to constantly change his line-up and formation because of the injury list at Old Trafford. "I did not see the incident..."
A classic Arsene Wenger response to Jack Wilshere's clash with Marouane Fellaini. "Honestly, I didn't see the incident." Joe Harries: Hate all this Wenger out nonsense. No one can blame the manager today, the only ones to blame are the players. Poor performance. Neo Legolas: Saying Wenger Out simply doesn't solve the problem but to think of it that's the only change left now. Andy Bradley: Why haven't Arsenal picked up quality defensive players now we have money? Questionable decisions costing us dearly recently. Arsenal manager Arsene Wenger: "It was one-way traffic and we lost the game, we have to take it on the chin. I know we'll be criticised for it but you have to respect the energy levels we put in. "We had the best chances and we could have finished better. At 1-0 we should have been more cautious not to give the second goal away. There was plenty of time to come back and that's where we made the mistake. "It was one-way traffic and we lost the game." That's the opening line of Arsene Wenger's reaction. He also says he expects criticism. "Luke Shaw has an ankle problem. It is not the same injury as what he had in advance of the game. We have to wait and see. It is unbelievable the injuries we have had. "It is the first away victory and the players are very excited but it is just one victory. We have to confirm that with further victories and then we can say we have the spirit and can start looking upstairs and not downstairs." Icemandb10: We were poor defensively last season, yet we lost Vermaelen and Sagna in the summer and failed to replace them. Wenger didn't build on last season he weakened the squad, he has not learned from his mistakes over the last decade. Frustrated Gooner: For those saying that Wenger can't be too blame, we have had the same problems with defensive frailties, lack of leadership and general profligacy for the last 4 seasons. The one constant has been Wenger, who also had a £100m budget to address these flaws last summer. Accidents and flukes happen, but not season after season. Wenger must go. Manchester United manager Louis van Gaal: "I think it is a fantastic victory at the right moment. We have a lot of injuries but despite of that we win a difficult away match. Arsenal are a good attacking team. At the end I can laugh but you can imagine if they score one of four or five chances in the first half it is a different game. "They have had five big chances yes, but we have also had possibilities at the end of the first half. Not so big but we could also score. In the second part of the first half we were coming back. We don't have the confidence in the first half and I said we needed to build up the ball and because of that we got chances. It is no surprise for me that we scored in the second half. I was not pleased with the ball possession of our team but after that we improved and in the second half we did very well." The haul of 17 points from 12 games is Arsenal's worst ever start in the Premier League. In a very entertaining interview, Manchester United boss Louis van Gaal says the injury worries he has are unbelievable and that Luke Shaw's injury is a new one, not related to the trouble he has had before. Louis van Gaal is refreshingly honest isn't he? He says he can laugh now but if Arsenal had taken any of their first-half chances it would have been a very different game. Manchester United striker Wayne Rooney: "We rode our luck at times, our goalkeeper was fantastic. "We felt they were vulnerable on the break and we hit them with two good goals, which was our game plan. "Paddy McNair and Tyler Blackett have coped really well. This will give us a lot of belief and confidence, it's come at a good time for us, It's been an indifferent start for us but we hope we can go on a good run now. We want to build a bit of momentum going into the new year and see where we are then." Atoyebi Oyelere: Apologies to Mourinho, he seems to be always right. Is there a better description of Wenger than a specialist in failure? 1. .Arsenal v Man Utd, 2. Man City v Swansea, 3. Stoke v Burnley, 4. Everton v West Ham, 5. Chelsea v WBA, 6. Newcastle v QPR, 7. Leicester v Sunderland. Arsenal, meanwhile, are in eighth place, seven points above the relegation zone but eight points behind Southampton. Manchester United are back up into fourth place after that win, but are still a mammoth 13 points shy of leaders Chelsea. In fact, they are closer to bottom-placed QPR than Chelsea. 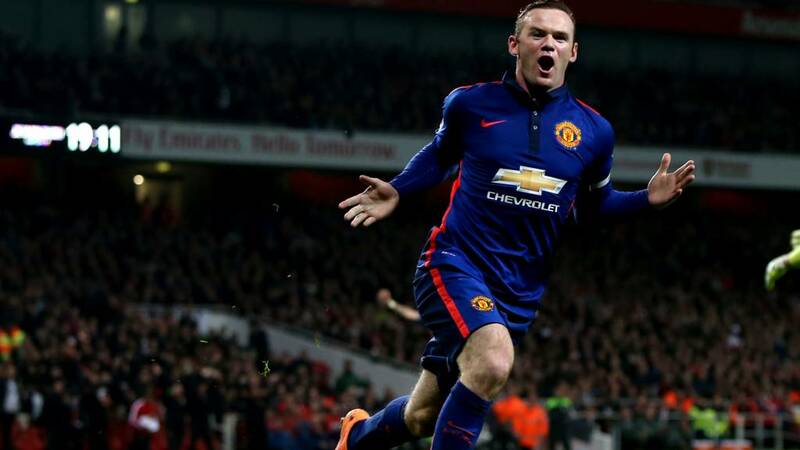 Wayne Rooney says that he knew Arsenal were vulnerable on the break and they punished them accordingly. It all went to plan. Alex McCord: Can't blame Wenger for this. Team was dominating totally. Injuries forced his hand. Failure. Harry Pitt: I'd never thought I'd say this, Wenger Out Now! He is done, we needed to win. Drama at the Emirates, but we are not done for the night. Not by any means. At 21:00 GMT, David Moyes starts his Spanish adventure when he takes Real Sociedad to fellow strugglers Deportivo La Coruna. You can follow that on our European football live text, which also has details of Lionel Messi's latest record. Over in Spain Lionel Messi has levelled Telmo Zarra's all-time La Liga goal scoring record of 251 goals, though the former Athletic Bilbao striker did in in 12 games less. It's all over! A smash and grab of huge proportions. Kieran Gibbs is on his knees. Gutted. That spice we were talking about pre-match is back. Calum Chambers lifts Angel Di Maria to the ground as the Argentine makes the most of a challenge, he then immediately hits the deck again and everyone piles in. A few yellow cards are waved. Still three of the eight added minutes left. Can Arsenal pull this off? What a hit! Arsenal have missed this man, Olivier Giroud marks his comeback with a cracking goal, smashing home from 22 yards. He just put his head down and smashed it into the top corner! Joe, Arsenal fan: Are Arsenal for real? What an inept and shocking performance. Dominate the ball and the game but they just cant score and they certainly don't defend!! Wenger Out. Richard in Maidstone: completely fed up with Arsenal and Wenger now. Just do the club a favour and go back to France, disgusted by this!!!! Jamie, Harlow: Tactically brilliant from Wenger. If we won here we'd be in danger of finishing above 4th. God forbid we should show any ambition. Losing this means we'll scrape 4th and he'll get his nice CL bonus again. Stewart McDonald: Enough is enough now. Replace Wenger now before we lose any hope of Champions League for next season. Far to stubborn. Mohamed Gafaar: Same old Arsenal, can't put the chances away then made to pay. No words to describe Arsenal this season. So so poor. EIGHT MINUTES added on?! Jonathan Pearce is losing his mind. Where on earth has that come from? Aidan Williams: Win even when you don't deserve to, Ferguson a master of it. Touche Van Gaal. Impressive. Andy Brown: Great counter. Reminded me of the Ronaldo/Rooney/Park days of yesteryear. Ashley Young - a sub - is subbed. Darren Fletcher sent on to totally kill the game. Oliver Zissman: I've never left the Emirates before the end until today. What a disgrace! Joe Vidler: Thanks for the memories Wenger. Seb Amann: I have no idea how Arsenal have lost this game. Absolute madness, they've been all over United. "While the Manchester United fans celebrate noisily in one corner of the ground, many Arsenal fans are making their exit. There are banners being held up in front of me reading "enough is enough - Wenger out"." One shot, two goals! That's the story of Manchester United's night. A clinically finished chance by Wayne Rooney though, and one that Danny Welbeck and Jack Wilshere could do with learning from. Better from Arsenal, they move it quickly and Santi Cazorla flashes the ball across the goal - but Tyler Blackett is stationed and clears his lines well. Watch and learn Kieran Gibbs! Manchester United are eight minutes away from moving back into the top four. And about eight players away from winning the league. DeathApeDisco: Klopp available next summer? Will there ever be a better candidate to succeed Wenger at the Emirates? Inspiration: Arsene is a good coach no doubt but you can only be good for so long #aresenlneedschange. Arsenal trying to thread a needle, intricate stuff on the edge of the box but United have seven back and Michael Carrick is able to make the block and clearance. Where's the plan b from the Gunners? They've not tested Tyler Blackett and Paddy McNair enough since going behind. So Arsenal now have Danny Welbeck and Olivier Giroud up front, with Alexis Sanchez in the hole. Plenty of options. Olivier Giroud is back, he's on for Aaron Ramsey. Can the big man have an instant impact? Muhumuza Joseph: Calamitous own goal...calamitous season so far well out of the title race. Overhaul at the Emirates needed. RAGreeneCNN: This is where #Arsenal show whether they deserve to be in the top four: Fight back, or roll over and die? James Wilson for Robin van Persie - it's a change we are getting used to seeing. It was said when Danny Welbeck left Old Trafford that Louis van Gaal saw Wilson as a better option. Can he show us all why? Alexis Sanchez scored twice for Chile during the break, but he can't find the target on this occasion, curling a free-kick over the bar. Danny Welbeck is then stopped in his tracks by Chris Smalling. Good tackle. Dave Payn: If Arsenal lose, well, you can only dine out on success for so long. Wenger's time surely up. Vaishach: the last thing Man Utd will be hoping this season is for de Gea to be injured than those defenders. Sensational. Timirlan Dzaurov: Bayern could easily take down these Arsenal and ManU sides... and I mean playing them both at once. Marouane Fellaini heads a corner tamely wide. Manchester United are set up perfectly for the breakaway now, everyone back with Angel Di Maria ready to burst clear at pace. Arsenal will have their work cut out to find any space - but they do have a corner. Robin van Persie heads away. Arsenal go direct, and to good effect. Danny Welbeck wins a header well, down to Santi Cazorla, and he rattles in a strike which David De Gea is again right behind. "Interesting to note that Manchester United are ahead without having had a shot on target - that Antonio Valencia effort was heading wide before it hit Kieran Gibbs. One player who has not helped in that department is former Arsenal striker Robin van Persie, who has not had a single shot at goal tonight, and has barely had a touch of note either. "All of that will not bother the Dutch striker, or his manager Louis van Gaal, if the score stays the same." There are a lot of big players out there who have contributed very little to this game. They have 25 minutes to have an impact. Few groans of frustration in the Emirates as a patient move breaks down. Tola: Man Utd winning without having a shot on target! Football Gods must be smiling haha. Harvey Austin: This is a battle of who is worse. Wenger actually winning that one. The very essence of 'taking one for the team.' Pure filth from Santi Cazorla to chop down Ashley Young. United were in on the counter attack and Cazorla is booked. Alex Oxlade-Chamberlain has had a cracking game and he's quick enough to beat his man again and stand up a cross. Alexis Sanchez attacks it, he gets there ahead of Antonio Valencia but his header is well held by David De Gea. Plenty of power, but not enough direction in the header. "It is the Manchester United supporters making all the noise now, and it will be interesting to see how the Arsenal fans respond to this setback - they have understandably been deflated since that bizarre goal went in. That was United's first real attack of what had been a completely one-sided second half, yet the Gunners are behind." Simon, York: You can't give Valencia time and space to line up his trademark vicious shot cross. No one in the world does it better than Antonio in my opinion. James, Oxford: Now shall we talk about the defences? Simon in Windsor: Wow what a joke saw it coming the whole game same old story dominate the game don't score then concede a shocking goal how much longer can this be allowed to go on. Can Arsenal respond. Everyone appears a bit shell-shocked by the nature of that goal. It had not been on the cards at all, Arsenal well on top since the break. But one ball in, Kieran Gibbs had a meltdown and now United lead. Send for Olivier Giroud? Wil: Cracking finish by Gibbs that. Paul Seaton: If ever a goal summed up a game, THAT was it. Utter calamity from start to finish. Ajay Patel: When everything is going against you, sometimes you need a little bit of luck.Valencia can't cross for his life,but he's scored. Wojciech Szczesny is keen to carry on but the matter is taken out of his hands - he's off and Emiliano Martinez is on in nets. It looks like Wojciech Szczesny will have to come off too. A disastrous 10 seconds for Arsenal. Manchester United lead without having a shot on target. A calamitous goal! Kieran Gibbs makes two errors, first of all he collides with Wojciech Szczesny as the goalkeeper punches away a cross. He is then sitting on the floor when Antonio Valencia flashes in a cross/shot from the right, but reacts in time to snake out a left foot and divert the ball into the far corner. Jack Wilshere comes back on but he can't run, he can't even walk to be honest. He sits down and that's that, time to come off. He is replaced by Santi Cazorla. Manchester City midfielder Yaya Toure: Great to score winner today!! Thank you for your fantastic support City fans - I really appreciate it!! #ComeOnCity! Jack Wilshere is on his feet, but his left ankle was severely twisted on impact, a horrible looking bend. Will he be OK? We shall see. He's off for some treatment now. Danny Welbeck should have done better there - and now Jack Wilshere is in real trouble. He is clattered by Paddy McNair as he released the ball, right at the base of the ankle. A heavy tackle, he really caught Wilshere. Lots of concerned faces from his team-mates. Impressive start form Arsenal. Per Mertesacker makes a mug of Marouane Fellaini, beating him twice at a corner to reach the ball first, but his half-volley is wild and over the top. Alex Oxlade-Chamberlain then frees Danny Welbeck over the top - but David De Gea makes another big save! Aetesam from London: It is pretty worrying when you look at the amount of goals Wilshere has scored for us. Yeah he's been injured a lot but with his ability it just doesn't make sense, his finishing is just appalling at times and is costing us here again. Mike in Derbyshire: Mike Dean has bottled a simple decision of a red card. He had a clear view of Wilshere putting his head into Fellaini's face, it had to be red? Balding of Highbury: Re Roy the DUFC fan, the 'average armchair fan' has only recently been given the voice to make daft comments via social media. Many fans have talked nonsense for years, myself included at times of frustration......C'mon Arsenal, break the habit of the last 10 years and stop wasting chances! Good pressing from Arsenal straight from kick-off, winning the ball back high up the pitch. High tempo, high intensity, that is when Arsenal were at their best in the first half. No changes at the break. Arsenal get us back up and running. Olivier Giroud to come on and win it? The Arsenal forward is back on the bench this evening. Steve Huish, Surbiton: If there's no pressure on LVG how come there was pressure on DM ? Surely he should of been given the same time frame as LVG has had. Rob, Southampton: Why are people having a go at united defence - we haven't conceded. Surely questions need to be asked of midfield on front of them? Andy, Manchester: As bad as the defence have been they've been getting no help from the midfield. Second to every ball has allowed arsenal to dictate the play and left the back 3 exposed. Only came back into it when our midfield got a grip. "Arsene Wenger is going to be remembered as one of the greatest managers that has graced the Premier League. "He brought a whole new culture to Premier League - the way we eat, the way we rest and the way players and teams are supposed to be prepared." Keke: Arsenal's mistakes are just gonna end up with glorification of De Gea and undeserving mockery of Wenger. Lewis Tizard: Wilshere is switching on my town's Christmas lights tomorrow, hope he makes the evening as eventful as his performance so far! Luis McClelland: Tyler Blackett is awful. Ox has been all over him, press more in the midfield and we've got this. Come on Arsenal! "It is hard to believe the first half ended goalless, especially from Arsenal's point of view, but Manchester United's latest makeshift defence not only held firm, it became a foundation for some very dangerous attacks by the visitors. "Michael Carrick and Marouane Fellaini have played a big part of that, putting in a shift - and some crunching tackles - to change the balance of power in midfield when Arsenal were running riot, and this game is still in the balance." Rian Hoskins: While injuries are a big part of the problem, even if Man Utd had their strongest back line, it wouldn't be amongst the best. Andy Donley: Hard to play passing football for @ManUtd when Valencia McNair Blackett and Smalling struggle so badly with the ball. Vivek E Singh: This looked like Arsenal's best chance to avenge 8 - 2 but looks like they will struggle to 3 points from this. Former Manchester United captain Paul Ince does not think Red Devils boss Louis Van Gaal is under any pressure - even if they lose at Arsenal. "No, he won't be under pressure. I don't think he is even looking at winning the Premier League this season - he's not looking at Chelsea or Manchester City. "He just needs to get United back into the Champions League. That's his ambition for this season, getting into that top four and building from there." Goalless at the break. Jack Wilshere wasted the golden chance. David De Gea is not 100% fit, flapping at a corner now. The ball is helped back in and Danny Welbeck tries an ambitious backheel, but he gets his angles wrong, sending his shot well wide. Good half this. An entertaining 0-0 so far. Roy a DUFC fan in Dundee: The average armchair fan has become less patient and less knowledgeable than ever. To criticise Man Utd right now is ridiculous. I've never seen a club suffer injuries to this level so to even be close to top 4 is a miracle. Quick fixes will only create a different problem further down the line. They were nowhere for 30 minutes, but now United are looking very dangerous. Three back-to-back corners from Robin van Persie end with Chris Smalling shanking a volley wide. Off his ankle. Not good technique. The visitors well on top all of a sudden though. Benjamin: Arsenal are determined to find a way to lose this game. Jonathan Atkinson: Get Juan Mata on the pitch absolutely disgraceful that Van Gaal is keeping him on the bench. Stunning pace! Angel Di Maria again, driving down the right wing on a counter-attack, leaving two Arsenal men in his wake before teeing up Wayne Rooney on the edge of the box. He shoots - but Nacho Monreal makes a sliding block to turn it away. "There is a superb atmosphere at Emirates Stadium tonight but the intensity of the home support was just dying down a shade before that little spat between Jack Wilshere and Marouane Fellaini got the Arsenal fans back on their feet again. "The Gunners supporters made even more noise when United's first real spell of possession ended with them forced backwards before Chris Smalling played the ball to his goalkeeper, and they are urging their side forward whenever they have the ball, which is pretty often right now." That's what he can do! Angel Di Maria has been anonymous to date, but cuts in and bends a brilliant effort from 25 yards, lovely shape and bend, whipping just past the corner. The £60m man can win a game in a second. Cameron Laws: How is Wilshere still on the pitch? You know the other way round Fellaini would be off. Richard: Wilshere has to go. The referee is looking RIGHT at it and doesn't even book him!? When did refs become so weak? Tom Saggers: Straight red, I don't see how he can't give that, he's right there. Bottled it. Arsenal attack again and Chris Smalling does well to sweep up. Arsenal and Manchester United are currently outside the top four in the Premier League, but which side will finish higher come May? Jack Wilshere squares up to Marouane Fellaini, a good seven inches taller (including hair), and referee Mike Dean has to intervene. Both skippers are called over and the international sign for 'calm down' is heavily deployed. I tell you what, Wilshere could have been sent off! He definitely put his head into Fellaini. At least as bad as Christian Benteke's red card v Spurs a few weeks back. Disrespectful or not, Arsenal scent fear in the inexperienced United backline. They have six men forwards for their latest attack and Tyler Blackett makes an excellent clearing header. Rob, Newbury: The comments about United's defence are ridiculous and disgraceful. So many injuries, very young players who are clearly talented. 14 clubs in the PL have conceded more. Robin van Persie makes a good defensive clearance for Manchester United as Arsenal continue to push on. No coherent play from the visitors at all yet. Mahesh: Knowing that Arsenal performance only deteriorates as the game progresses, they should have made the most of those 3 chances. Sushant Shetty: Di Maria was paid 60 million to win matches like these. Owes a big performance. Dave Payn: Are Arsenal just scared of beating Man U? Dominating them at the moment but are doing their best not to score! Stoke City manager Mark Hughes: "We're disappointed with the opening period of the game and that's what has cost us the three points. "(Erik) Pieters failed a fitness test and our back four was thrown together this morning, but we're still a team that should not allow the opponent to go into a 2-0 lead. "From our point of view we are desperately disappointed, we gave ourselves too much to do. It's a difficult league to gain points in, but in certain games you need to do better in and this is one of them. We were totally dominant." Is David De Gea struggling now? Goodness me. He dislocated a finger on international duty and after saving from Alex Oxlade-Chamberlain looks in a lot of pain. Anders Lindegaard is on the bench. De Gea looks like he'll carry on but Arsenal must be tempted to shoot on sight? Burnley: 27% possession... three points. How? Alex Regueiro: Parking the bus and counter-attacking... it's a very successful tactic, very easy to implement. Nothing new. This has been done many times before, against top clubs too. Ronald Ronns: It's simple you let them kick the ball around aimlessly like Barca or Bayern then take the ball when u need a go and score! This is a real test...But when you've got Wayne Rooney, Robin van Persie and Angel Di Maria in the side you should be doing OK.
Rooney fires the free-kick over the top, first real attack from United. After watching Chelsea's first-half display earlier on, both of these sides are miles away. "Manchester United are under the cosh here and the Arsenal fans know it, roaring their team forward and screaming in frustration when an attack comes to nothing - with Jack Wilshere's failure to beat David De Gea from close range after bursting into the box a case in point. "Luke Shaw's exit is not going to help United much either. The Arsenal fans booed Ashley Young when he came on - even though he is a Gunners fan - but the Gunners were already getting an awful lot of joy down their right flank even when Alex Oxlade-Chamberlain was up against an orthodox defender. "United have two wingers as wing-backs now, and Chris Smalling has a huge organisational job on his hand with two rookies making up the rest of his defence. As Graham Taylor might say: This is a test." There's a lot of pointing and chatter in the Manchester United defence, some drastic reorganising and filling of holes going on out there. At the other end, Ashley Young and Wayne Rooney link up well and Angel Di Maria wins a free-kick. Shohidur Rahman: This is ridiculous. We're all over the place. Only a matter of time before Arsenal score. I'm pretty sure McNair, Blackett & Young did the conveyancing on my house move. Can they defend though? Another injury for Manchester United. Luke Shaw is off with that injury he suffered in the opening minutes, so Ashley Young is on at left wing-back. United's back five: Valencia, Smalling, McNair, Blackett & Young. You have to score! Terrible finish from Jack Wilshere! Alexis Sanchez starts it by hassling David De Gea into a poor clearance, Danny Welbeck slides Wilshere in on goal and he's clean through, one-on-one. He has all the time in the world, dribbling up to the six-yard line, but his shot is tame and saved by De Gea. Not good enough. Not clinical enough. Fresh from his fine display for England in Glasgow, Jack Wilshere picks the ball up in midfield and drives on, before testing David de Gea with a low shot from 20 yards. Moments later Danny Welbeck also calls the Spaniard into action. Both straightforward saves, but there is only one team attacking so far. Nerves in the backline as Tyler Blackett runs into the back of Luke Shaw and then has to scurry across to cut out an errant pass. The boys in blue looking ragged early on. The same combo do the damage for Arsenal, Alex Oxlade-Chamberlain finding Danny Welbeck in the middle but this time his header finds the stand behind the goal. Is it written that Welbeck will find the net today? Luke Shaw is back with us by the way. Not moving too well. "Chris Smalling is in the middle of Manchester United's trio of centre-backs and, in the first few minutes, has been talking constantly to Tyler Blackett (to his left) and Paddy McNair (to his right). That communication is going to be key for United tonight, as is the central midfield shield of Marouane Fellaini and Micheal Carrick in front of them. Arsenal are pressing hard in the early stages, roared on by a very noisy crowd." ANOTHER injury for Manchester United? Luke Shaw is down clutching his ankle. Surely not? QPR manager Harry Redknapp: "It looks like it was going to drift away to 0-0. The goal just came and we couldn't get back into it unfortunately. Maybe we weren't quite creative enough. "It's going to be tight [down the bottom]. People were writing Burnley off two weeks ago then they get two wins and jump out of the relegation zone. There are going to be seven or eight teams involved." Predictably, the first chance of the night falls for Danny Welbeck. Alex Oxlade-Chamberlain breezes past a lazy challenge from Marouane Fellaini, finds Welbeck breaking into the box and his shot is turned away fro a corner. In the battle of the giants Per Mertesacker then beats Fellaini to it, heading wide. Good start from the Arsenal. West Brom manager Alan Irvine: "Obviously this is a really difficult place to come. They're a top team. We were looking to get off to a good start and obviously the first goal after 11 minutes made it hard. We certainly had to have a shape about us and have discipline, but to lose those first couple of goals was obviously against what we were trying to do. "We had a game plan which was made more difficult by the first goal which I think was offside. But the second one I was disappointed about - we pride ourselves on being organised at set-pieces and we weren't as organised as we should have been." On the red card for Claudio Yacob: "I can see why he sent him off. I don't think Claudio was trying to do any damage to Diego Costa, he was trying to win the ball, but the rules are such that if your feet leave the ground with both feet you're not in control. It was a big big task from the moment Claudio was sent off." Joshua O'Dwyer on Facebook: Why are people talking about Chelsea going a whole season undefeated like it easy? Its not. That why it only happened once in PL history. Henry Mutuku on Facebook: This title is going 2 Stamford Bridge and I believe we are going 2 clock 95 points. Burnley manager Sean Dyche: "We took a 2-0 lead and I thought we deserved it with our counter-attacking football. At 2-0 down Stoke had nothing to lose. They kept coming at us. "Our will and desire to win was fantastic, but that's something that you have to build and work on. Our players are learning and developing. We know we're never going to roll through the Premier League, slotting the ball around. We have to win and we did that, but we have to find different ways of winning. "Now we have two wins, but we need more. I believe we can do what is deemed the impossible and make it possible. We have been written off by everyone. At the start of the season I said we were one of the biggest underdogs in many years." Newcastle manager Alan Pardew on Match of the Day: "I thought we was excellent. A lot of senior players were missing, but today's players performed terrifically. We had some nice performances - I was really, really pleased." Asked about the squad: "What you see as a manager you think 'this could be something' but then you have a run of disappointments and you start questioning your own eyes. Then we got the win and go on a run. But today is tinged with sadness with Ryan Taylor's injury and we are sweating on the scan." "Danny Welbeck knows he has a chance against his former side tonight. "I would be tempted to say that Arsenal could have gone with two up top with Manchester United playing three at the back." It is a back three for Manchester United, Jonathan Pearce describing Chris Smalling as 'the daddy of the three' - he's flanked by Paddy McNair and Tyler Blackett. West Ham manager Sam Allardyce was clearly not happy that Romelu Lukaku's opening goal was allowed to stand. He said: "The assistant referee and referee allowed them to take a goal after a blatant offside. "I'm sure they'll try to interpret it to say it was a right decision but I will never accept what they say and if they go hiding behind Uefa or Fifa again, then they'll be letting themselves down. "You've never seen anyone not given offside this season for something like that, however you interpret the rules." Mwangikiara: Always rated Welbeck... Still feel terrible that Utd let him go to ARSENAL!! if he scores today, I'll be happy for him. Ross Sysum: Blackett and McNair have been United's best CBs this season and deserve far more respect than they're getting! "Everton were a little bit fortunate today because you could argue that Romelu Lukaku was offside when he gave them the lead." What is Big Sam thinking here? "Boos ring out for United's former Arsenal striker Robin van Persie as his name is read out by the stadium announcer at Emirates Stadium. "It's been a dank day in north London but there is an air of excitement around the ground as we approach kick-off. A title may not be on the line this time but a win could act as a springboard for both teams - especially a United side yet to win on the road in six attempts under Louis van Gaal. "One word sums up both team's defences though - vulnerable." Everton manager Roberto Martinez: "It was full-blooded to be honest. Both sets of players gave a whole-hearted performance. "It was a difficult game for the referee but I thought Mark Clattenburg handled it well. It's one of those wins that gives you great satisfaction, because there was good character and personality. "The winning goal came in the best possible way, from Leon Osman - a great icon for Everton." "Alan Pardew believes in his players and they believe in him too. Whenever they score the players are always running straight over to the bench to celebrate together." Newcastle manager Alan Pardew: "I think we will know about Ryan Taylor in the next two or three hours. We are hoping it's just a scare." Midfielder Taylor was making his first league start for the club in 32 months and left the field in tears. Amy Lawrence: "It all started in 1987 when Arsenal midfielder David Rocastle was very young, got wound up by Manchester United's Norman Whiteside, aimed a punch at him and got sent off. they had the big fight in 1990." Football writer Amy Lawrence believes Arsenal and Manchester United fixtures lack the intensity of days gone by. "They were unbelievable fun. They were riveting and an energy around them. The players were of a profile and used to playing against each other. Today's game there will be quite a few newcomers for Manchester United and Arsenal have not got the same calibre of characters which they had in those days. "They were ferocious and it goes right back to when Sir Alex Ferguson came down from Scotland and George Graham was Arsenal manager." Michael Sayles: Crazy that at this stage of the #PremierLeague season the top 6 would include Southampton, Swansea, Newcastle and West Ham! Jay: United's defence is obviously worrisome but what a chance for Blackett/McNair to stake a real claim to those positions! Saran Markan: Just refreshed the page 3 times and Newcastle still remain in the top 4. So it is real !!!! Samsonite?! I was way off! They may have struggled to navigate from Rhode Island to Aspen, but prospective pet store owners Lloyd Christmas and Harry Dunne have managed to make their way to the Emirates in time for tonight's game. Sunderland manager Gus Poyet on Lee Cattermole's yellow card, his sixth of the season: "10 years ago his tackle would have been highlighted as one of the best in England. We are going soft. These people that never play football and don't have a clue are trying to make it a non-contact sport. This is football. It was a proper English tackle." Sunderland boss Gus Poyet: "We were waiting to see the shape of Leicester because they have been changing it the last few weeks. We knew after first 15 minutes it would be difficult and they would come at us but after that we were comfortable. I think we had the best chance of the game with Fletcher. It was a game where you are trying to win but don't risk enough to lose it. It was a balanced game I think. "We have got much better in recent weeks. We are a difficult team to beat again. When we conceded eight goals at Southampton it was after an international break, so we had a big point to prove today and I am very pleased we proved it." Manchester City manager Manuel Pellegrini: "Very happy because we won the game. We played very well and had a lot of chances to score the third goal and we defended well. It was a difficult start because they scored with their only chance in the first half. "We are absolutely confident the way we play and sure we are going to win the game. If we scored the third goal we could play well and not so tight. "We had the chances but didn't score. The best way to score goals is to play as a team. The second goal was beautiful play. urged Gunners fans to "appreciate" Arsene Wenger and football writer Amy Lawrence agrees that some supporters can easily forget the Frenchman's impact. "Whenever Arsene Wenger retires, people will look at his career as a complete works and they will assess everything he has done over that time," she says. "Right now people are looking at this season and you can't expect critics, or football fans, to constantly look at this bigger picture. Unfortunately we take it too far the other way, where when you win and you're a genius then the next week have a nightmare and you're an absolute loser. "Perspective is a great. But expecting people to have perspective, to look at 18 years' work, is difficult when you've just chucked away a three-goal lead at Anderlecht or a one-goal lead at Swansea." "With so much of the pre-match focus on Danny Welbeck, it is easy to forget that Manchester United striker Robin van Persie also facing his former club, after spending eight prolific years in north London between 2004 and 2012. "The 'rule of the ex' seems to apply to the 31-year-old Dutchman, who has bagged three goals in four matches against the Gunners since moving to Old Trafford in 2012. "Van Persie has topped the Premier League scoring charts with both clubs but his current form is under scrutiny and he admitted last week that his three goals in nine league games this season are "not enough". "That is especially true when you consider the chances he has missed. Of the 35 players to have scored three or more goals in the Premier League this season, Van Persie has the worst shot conversion of them all - 13.6%, according to Opta. Paddy McNair v Alexis Sanchez? Nacho Monreal v Wayne Rooney? Angel Di Maria v Mikel Arteta? Danny Welbeck v Tyler Blackett? There are some fascinating duels on the cards at the Emirates this evening. Some real mismatches on paper. Leicester boss Nigel Pearson: "I thought we played pretty well under the circumstance - a difficult run of results - and created some good chances. You could argue we did enough to win the game. "Before today we had only kept one clean sheet so there always positives from getting a point. It is frustrating for the players because they played well and created many opportunities. "We tried to win the game. I felt we were more likely to win than our opponents. We were aggressive with the way we went about things but it didn't quite happen for us." Chelsea manager Jose Mourinho: "It was comfortable but I thought in the first half we played amazingly well. In the first half we have to be 3-0, 4-0, 5-0 up. But the quality of our football was there. I don't remember seeing many times football of that dimension. We made the pitch very wide, we created spaces in the central area, and the result should be better than 2-0. We are playing well. We are getting the results that we deserve and I'm pleased that we did. Especially after 15 days when I have no players to work with. But it's three important points." On Diego Costa after two weeks' rest: "It's easy to see the difference in him now, because now he can run, he can sprint, he can challenge for every duel." "It was a really big win. "We have had two weeks to clear our heads and I think the performance was good other than the first 20 minutes. "It should have been more comfortable but we'll take the win after the last month or so. We looked good in possession." "Arsenal have given away a cardboard cut-out of Danny Welbeck with today's programme and the former Manchester United striker will be on the pitch for real after shaking off a hamstring injury to start against - and face for the first time - the club he supports and spent 15 of his 23 years playing for after joining them at the age of eight." From Johnny, London: So bogey teams do exist! So many things went wrong for West Ham today. 5 key players out, a dive from an opposition player, an offside goal and getting no points even though we were the superior team! Vince in London: I'm an Arsenal fan. However all of you writing United off are overlooking one thing. Wenger and Arsenal are and have been mentally and tactically inept against united since 2009. Put United shirts on a pub team and we still wouldn't beat them. "If Arsenal striker Danny Welbeck needs any extra motivation before facing his former club then he only had to flick through this morning's newspapers - where headlines like "None of us rated Wel" and "You're just a sub" tell the story of how Louis van Gaal has no regrets in letting him leave Manchester United in September. "Welbeck's bit-part status at Old Trafford is underlined by how little he has featured in meetings between these two sides in the recent past - playing in just two of a possible 15 games since he made his United debut in 2008. "But his record in this fixture when he has played is remarkably good - he scored the winner at Emirates Stadium in January 2012 and scored the first goal in United's 8-2 demolition earlier that season. More goals today might just make Van Gaal eat his words." Sean Cole: Interesting tactics from Burnley. Play the other team off the park for 20 minutes, get 2 goals up then defend like billy-o. Julian Croker: Liverpool & Tottenham currently closer to the bottom 3 than the top 4. Milo Thompson: Mike Ashley is probably fantasising about the money he'll get for Moussa Sissoko in January. In the Championship, Derby remain top of the tree thanks to a 2-1 win at Watford. Elsewhere there were wins for Blackburn, Nottingham Forest and Birmingham. Rotherham have slipped into the relegation zone after their 1-0 defeat by Blues. The two most exciting games in the league saw Bournemouth draw 2-2 with Ipswich and Norwich tie 3-3 with Brighton. League One leaders Bristol City fell to a second successive defeat after Callum Robinson's first half goal for Preston. Swindon have kept pace with North End courtesy of a 2-1 win at Peterborough while Leyton Orient hammered lowly Crewe 4-1 to move out of the relegation zone. Elsewhere, there were wins for Coventry, Walsall, Doncaster, Yeovil and Chesterfield. Exeter City produced the comeback of the day to beat Shrewsbury 3-2 after trailing 2-0 at the break. Wycombe came from a goal behind to thrash Cheltenham 4-1 and Jimmy Floyd Hasselbaink's Burton won 1-0 against Luton to go second. At the bottom of the League Two table Hartlepool and Tranmere are six points adrift of safety after defeats by York and Southend respectively. Other winners were managerless Mansfield, Accrington, Dagenham, Newport, Northampton and Portsmouth. "We got a good goal and the players' mentality changed a little bit as we tried to protect it. A learning process for us, the players are fully committed. We pushed an exceptional team very, very close. "Of course City will push for the title, I don't doubt that." "The statues outside Emirates Stadium are a reminder of happier times for Arsenal, but also demonstrate how it has been a long time since United's status was also so low. "It is more than 16 years since they last faced each other with both teams outside the top four, when Tony Adams - now immortalised in bronze outside the Gunners' ground - scored Arsenal's first goal in a 3-0 win in September 1998. "That was the season United went on to win the treble and Arsenal finished second, a point behind them. Those days must seem like a million miles away for both clubs now." Arsenal striker Danny Welbeck should have an element of revenge on his mind when he faces Manchester United for the first time, says ex-England midfielder Jermaine Jenas. "You don't want to get carried away and lose sense of game plans but it is important to keep being sold at the forefront of your mind," says Jenas. "He was at one of the biggest clubs in the world, had Robin van Persie who wasn't playing that well being picked ahead of him and you've got a young lad, an international who came through the ranks, and all of a sudden he's being told that he is no longer needed. "If I was Danny Welbeck that would be at the forefront of my mind and I'd be ready to go." Will in Oxford: That Arsenal back line looks vulnerable, Arteta will have his work cut out. Luckily for them though the Utd back line looks even worse! Should be a good watch for the neutrals, what price on 3-3? Lee, Manchester: For all the slagging off of Man United this season, how many teams above them have had to play a different back four in every game and include at least one newly promoted reserve, let alone two at the emirates??!! "In the first half we played amazingly well," is Jose Mourinho's summary of his side's display. "Arsenal's attack is boosted by the presence of Alexis Sanchez, despite concerns over his freshness after his international duty for Chile, and by the early return of Olivier Giroud, back a month ahead of schedule after breaking his leg at the end of August. The Frenchman is on the bench." John Pierce: West Ham played us off the park. But thanks for the points. Rishabh Kapoor: I don't see what's the fuss about United formation. Smalling and blackett in cb and mcnair in midfield. He's a midfielder. Sunderland's Adam Johnson: "I thought we played well and could have won the match. We are three games unbeaten now so we need to try and carry on that run now." Manchester City captain Vincent Kompany: "Given the last month we will take a win and it is good we are creating chances again. We have given ourselves a challenge but football is made of challenges. We can get a lot of good out of this year." "Manchester United's defence has been an ever-changing beast this season and there is an element of mystery over how they will line up at the back. Louis van Gaal names three centre-backs in Chris Smalling, Tyler Blackett and Paddy McNair and the presence of Luke Shaw and Antonio Valencia means they will probably play with wing-backs. "But Smalling could also operate at right-back, with Valencia further ahead of him, in a 4-4-2 formation that would leave an unexperienced pairing of Blackett and McNair, aged 20 and 19, at the heart of United's defence. "Further forward, the good news for United is that Angel Di Maria is fit, and joins Wayne Rooney and former Arsenal striker Robin van Persie in attack." Man Utd line-up: De Gea, Smalling, McNair, Blackett, Valencia, Carrick, Fellaini, Shaw, Di Maria, Rooney, Van Persie.